Mr. Manzo focuses his practice on insurance services, with a particular emphasis on the evaluation, resolution, and/or litigation of coverage disputes. 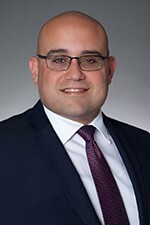 Mr. Manzo is experienced in handling both first party and third party disputes under various coverage forms. Prior to joining Hinshaw & Culberston LLP in 2015. Mr. Manzo practiced with the law firm of Atkinson & Brownell, P.A. for five years. Mr. Manzo's clients have included a number of different insurance companies. Mr. Manzo enjoys college football and traveling.